Two weeks ago we had some snow flurries, but at long last the buds on the trees have morphed into actual leaves and any precipitation we’re getting isn’t frozen. But when it comes to preciptation the kids in Minnesota are going to get soaked between now and next weekend. As much as I love summertime thunderstorms I’m not so sure I want one this weekend, more specifically this Saturday. Rain or shine I’ll be at the Hopkins Mainstreet Days Arts and Crafts Show on Saturday from 9:00 to 4:00, along with my trusty roadie, Husby. Today I’m all about making sure everything is packaged, priced, and ready for sale and even took vacation time from the day job to complete the project. This is the first show of the season for me, so I want to make sure I have all the bases covered. You can’t miss the Auntie B’s Wax sign. The first show of the season always makes me a little nervous, but preparing for it is also invigorating. Coming out of the studio into the outdoor air to mingle with my species as they peruse the works of artisans feels as fresh to me as the new spring air. 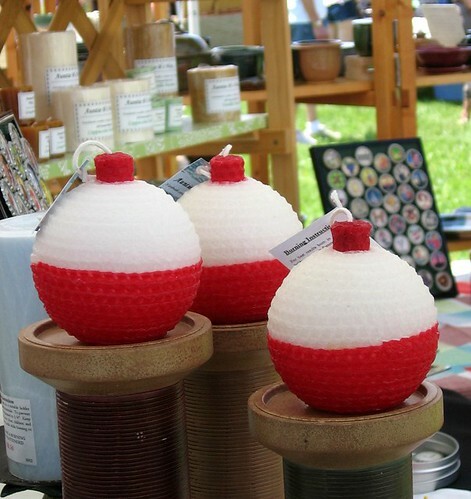 The always popular bobber candles. If you can’t come to the Hopkins Mainstreet Days Arts and Crafts Show, please send a message to the weather gods to hold off on the rain until about 6:00 Saturday evening. After that I won’t mind all the rain they have to give us. That is, until the next show. Smiling at Auntie B’s pulp fiction magnets. Thanks Lucie! I’m looking forward to a whole new venue and a brand new set of customers. Should be fun! I’ll be hoping for sunny skies for you. Have a blast! Thank you Cindy. Right now it doesn’t look like sunny skies, but it will most likely be the only day in the next five or six that won’t have thunderstorms. Keeping my fingers crossed! Wishing you the finest of weather and crowds of people to buy your unique and lovely creations! 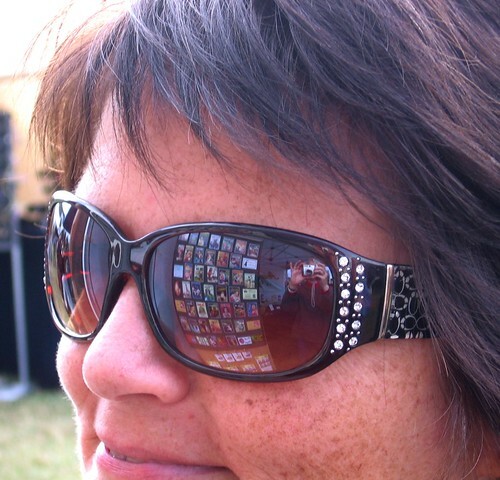 Thanks Lorna – wish I could see you there!